This Thursday, TechCrunch is staging our first Pitch-off and Meetup in Seoul, South Korea, in collaboration with Google Campus. With just over 48 hours to go, we wanted to give a full picture of the schedule and speakers for the 1,300 people who are down to attend and others who are interested. The pitch-off takes place at aA Design Museum in Seoul on April 16 — unfortunately we are sold out, so please only come along if you have already secured a ticket. Doors will open at 6pm and there will be casual networking for an hour to kick things off. Come 7pm, my colleague and MC for the evening Mike Butcher will get the show started with opening comments from Jeffery Lim, who is the Managing Director of Google Campus Seoul. We want to help entrepreneurs and startups. So beyond just hosting the pitch competition, the Meetup will begin with four, ten-minute fireside chats with notable figures within South Korea’s startup scene who will provide details of their experience and insight. Once the chats are over, we will move on to the famous TechCrunch Pitch-Off — Seoul style. Last week, we revealed the 10 startups that we picked from the hundreds that applied. Each one will have two minutes to pitch our judging panel. There will then be four minutes for follow-up questions and answers. The panel will select the top three startups from the competition, each of which will receive prizes including tickets to a future TechCrunch Disrupt event… and, of course, the kudos that comes with winning. The pitch-off winners should be announced just after 9:30pm, which leaves more time for networking before we wrap the event up some time after 10pm. 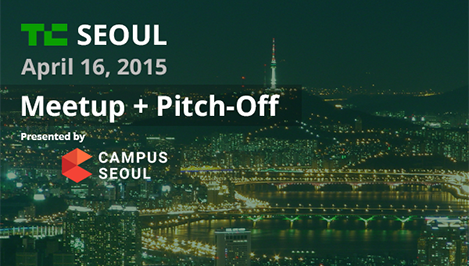 We’re super excited to bring our Pitch-Off event in Seoul, and look forward to meeting you on Thursday!